To find the best outdoor propane heater, we spent spent close to 16 hours researching 20 different outdoor propane heaters. 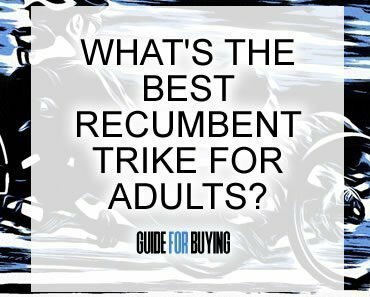 As part of our research, we looked at hundreds of customer reviews, watched consumer videos and read advice from experts in the field. From these, we narrowed this down to our top pick and four runners-up. Outdoor propane heaters (sometimes referred to as “patio heaters”) aren’t just for bars and restaurants anymore. These popular appliances have been engineered and adapted for home/backyard use now. In this article, we’ll share our top five picks for best outdoor propane heater. We’ll also answer the question: “how does an outdoor propane heater work?” We will describe the various types on the market. We will also describe some of the features you’re likely to find on an outdoor patio heater. How Does an Outdoor Propane Heater Work? 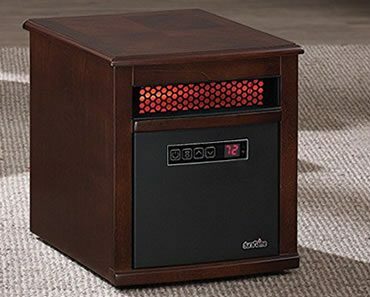 For those who like to enjoy their patio or deck year-round, the patio heater is a must-have. They come in a variety of shapes and sizes. The ones that resemble lamp posts are probably very familiar to many people. 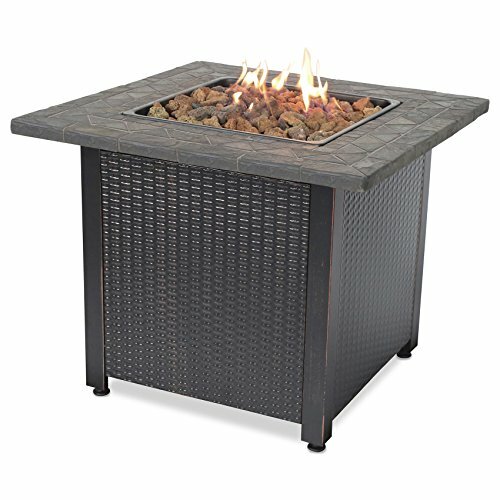 Many consumers will also recognize firepit-style heaters that evoke a camping feel. In reality, these heaters can take just about any shape or form. The earliest models were fairly utilitarian and industrial-looking. Today, designers are making outdoor patio heaters that are as aesthetically-appealing as they are functional. All of them, no matter what they look like, function in essentially the same manner. In fact, they work a lot like your propane-powered barbecue. The tank connects to a tube with a valve. Open the valve, and the gas is able to flow from the tank through the tube. The tube carries propane to the burner. Next, the igniter is activated. This sparks a flame that ignites the burner. Voila! You now have heat. Stand-type patio heaters simply radiate heat. Other types, like firepit-style heaters, may also give off a flame for added ambience and a realistic campfire effect. However, there need not be a flame to produce heat. 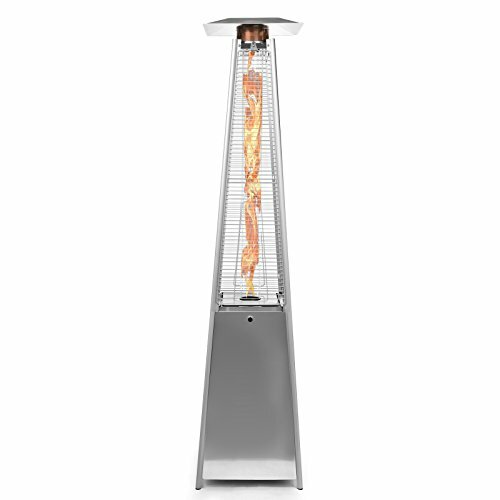 Outdoor propane heaters are designed to radiate heat in a circular direction. In other words, heat flows from the center, outward in all directions. This type stands by itself, like a floor lamp. They may sometimes be mounted on wheels. This makes them easier to move from place to place. This type is smaller than a freestanding heater. They are designed to sit on top of a table, like a table lamp. This type is circular in shape. It is designed to mimic the look and feel of a campfire. This type is similar to the firepit type, with a real flame. However, they tend to more closely resemble a fireplace than a campfire/firepit. It helps to understand a little bit about these devices when choosing the best outdoor propane heater for your space. Number of square feet that a particular heater is capable of heating. Heating radius: Remember, outdoor propane heaters radiate heat from the center, outward in all directions. Therefore, individual units will also come with information about the diameter of space it is capable of heating. Number of BTU’s (British Thermal Units). This is how heat is measured. The higher the number of BTU’s, the more heating power a device has. The greater its heating power, the bigger an area the device is able to heat. These three bits of information should be the starting point to guide your search for the best outdoor propane heater. 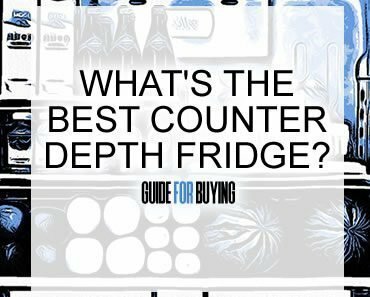 Therefore, before you start shopping, you’ll need to know the size of the space that you want to heat. Fortunately, all of the models on our best outdoor propane heater list are capable of heating between 1200 and 1840 square feet. They are more than sufficient to provide enough heat for the average to large-size home patio. Portability: Will you be assembling your heater and leaving it in one spot all the time? Or do you prefer a model that can be moved if necessary? Some outdoor propane heaters have wheels, others don’t. Physical size: The dimensions of the unit itself might be important for you. For instance, if you have a covered patio with a low ceiling, a seven foot tall heater might not be your best choice. Fortunately, patio heaters come in a variety of sizes. Not only that, but size (or lack of it) doesn’t necessarily impede its power. There are some nice tabletop, fireplace and firepit style heaters that are capable of heating 1200 square feet and more. Tank size: These devices are powered by propane, just like a barbecue grill. 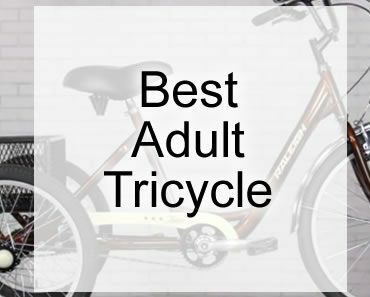 In fact, most every one you’ll come across uses a standard-size 20 lb. tank. It’s important to note, though, that you almost always have to purchase the tank separately from a licensed propane seller. Safety features: Most outdoor patio heaters sold in North America already meet high safety standards. An example of this is automatic shut-off of the device if it accidentally tips over. However, some units may have extra safety features that might appeal to you (i.e. child safety guards). Design: Patio heaters come in all kinds of designs, as we mentioned earlier. Not only that, but they’re available in a variety of colors and finishes, too. We love the classic look of the AmazonBasics Havana Bronze Commercial Patio Heater. Its Havana bronze finish makes it even more stunning and makes it fit nicely with any color scheme or decor theme. However, it has more than looks going for it. With 46,000 BTUs of heating, it ties our best outdoor propane heater 2nd runner up for most power. 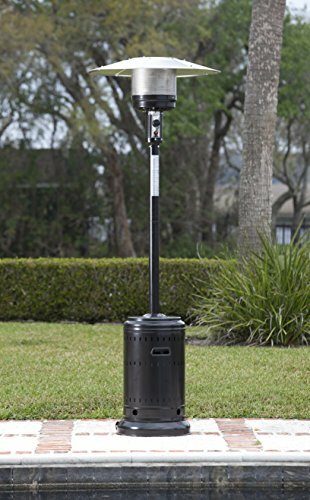 It is capable of heating a patio, deck or backyard space of 1840 square feet, significantly more than any other model on our best outdoor propane heater list. At almost 7 and ½ feet tall, the AmazonBasics Havana Bronze really stands out. It will make you the envy of your neighborhood. Your house will be the place to go for outdoor parties. Do be aware that this heater is a bit on the complicated side when it comes to assembly. However, if you’re handy (or know someone who is), it’s a small price to pay for such a desirable heater. Speaking of paying, we would have expected a heater like this to be more expensive. We really love the fact that it sells for less than $120, a very affordable price. Some users reported that the instruction manual was hard to follow; some users reported this unit does not produce enough heat. Remember how we talked about variation in the design of modern patio heaters? The AZ Patio Heaters Patio Heater is a prime example. We were drawn to its eye-catching, skyscraper-like shape that will add not only heat but also beauty to your patio. The AZ Heater puts out 40,000 BTUs of heat. Its quartz glass tube is another characteristic that sets it apart from the other units on our best outdoor propane heater list. Quartz is an excellent heat conductor that looks beautiful, too. This unit comes with wheels so you can change move it from place to place easily. Its elegant hammered bronze finish will complement any decor. One thing you should beware of: some people who previously bought this unit made comments about the assembly instructions. They said they were hard to follow. If you don’t consider yourself handy, you might want to have someone who is on standby when you assemble this unit. Material: Steel construction with a powder-coated bronze finish. Here is another classic-look heater that has noteworthy heat output at a reasonable price. 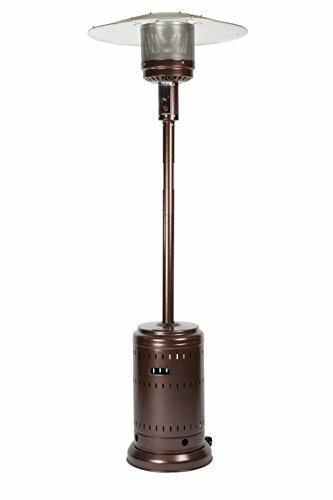 The Fire Sense Hammer Tone Bronze Heater is a lampost-style model with a rich dark finish. You can also choose from several other colors/finishes if you don’t mind paying a little bit extra. This unit gives off as much heat as our top pick heater. It is capable of radiating heat to up to 18 feet in diameter. We like the fact that the Fire Sense Hammer Tone is one of the easier models on our best outdoor propane heater list to assemble. When you put it together, be sure to add sand or water to its base for stability. Users have reported it tipping over in heavy wind. Safety features: Safety auto shut-off tilt valve, protective mesh surrounding the ceramic-glass heating column, pilot light for safer startup and shutdown. Like the previous heater on our best outdoor propane, the Thermo Tiki Deluxe is a head-turning pyramid-shaped heater. It looks so sharp, guests might not even realize it’s not just a decoration. Once you fire it up, though, they’ll be mesmerized by the dancing flame. It’s all contained within an efficient ceramic column. It radiates heat up to 15 feet in diameter. This fireplace is built to last. Its weather resistant finish ensures you can enjoy the ambience of an outdoor fire for years to come. Safety features: Dedicated control panel at the base. Here is yet another example of a heater that deviates from the so- called “norm” in design. It’s a gorgeous fireplace-style heater for tabletop or freestanding ground use. The Endless Summer GAD1401M uses lava rocks for both heat and aesthetics. The lava rocks are included in the price and will last for years. If you hate assembling things, this is the device for you. There is little to put together on this beautiful little fireplace. You won’t even need any tools! Because of its size and heat output, the Endless Summer GAD1401M is ideal for small patios. This device even comes with a cover at no extra cost.